Summary and Definition: The Vietnam War officially ended on April 30, 1975 although direct U.S. military involvement ended on 15 August 1973. The End of the Vietnam War began with secret peace talks led at first by Henry Cabot Lodge, Jr. and then by Henry Kissinger. The Paris Peace Accords was signed on January 27, 1973 and included a ceasefire agreement ending US Involvement in the Vietnam War. No sooner had the U.S. troops withdrawn, the ceasefire agreement collapsed and the North Vietnamese Army launched a full scale invasion of South Vietnam. The Fall of Saigon occured on April 30, 1975 when South Vietnamese government surrendered to the Communists, marking the final end of the Vietnam War. 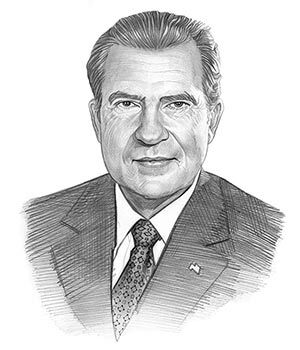 Richard Nixon was the 37th American President who served in office from January 20, 1969 to August 9, 1974. One of the important events during his presidency was the End of the Vietnam War. Fast, fun facts and Frequently Asked Questions (FAQ's) about the End of the Vietnam War. When was the End of the Vietnam War? The End of the Vietnam War officially ended on April 30, 1975 although direct U.S. military involvement ended on 15 August 1973.
Who was president at the End of the Vietnam War? Richard Nixon was the U.S. president at the end of the Vietnam War. What treaty was signed to End of the Vietnam War? The Paris Peace Accords of January 27, 1973 were intended to establish peace in Vietnam. It led to a Ceasefire agreement and the withdrawal of U.S. troops in Vietnam. What caused the End of the Vietnam War? ● By the end of 1971 opinion polls showed that 66% of all Americans wanted the Vietnam War to end as quickly as possible. End of the Vietnam War Facts - 2: Nixon adopted the strategy of 'Vietnamization' to equip and train South Vietnamese forces so that they could take over more military responsibilities against the communists allowing the United States to disengage combat forces without appearing to abandon South Vietnam. End of the Vietnam War Facts - 3: In June 1969, the first 25,000 U.S. troops were withdrawn from Vietnam and a further 60,000 troops followed by the end of the year. End of the Vietnam War Facts - 4: In August 1969, Henry Kissinger, the National Security Advisor, met secretly in Paris with Le Duc Tho, his North Vietnamese counterpart, but little progress was made. End of the Vietnam War Facts - 5: Nixon adopted a get-tough policy to force an agreement on his terms and ordered negotiator Henry Cabot Lodge, Jr. to stage staging a walk-out on the peace talks on October 23, 1969. End of the Vietnam War Facts - 7: News of the My Lai massacre broke in America on November 12, 1969, to the horror of the nation. End of the Vietnam War Facts - 8: On December 8, 1969 Chief US negotiator Henry Cabot Lodge Jr., and his deputy resigned, expressing pessimism concerning the negotiations with the North Vietnamese and seeing no role remaining for a peace negotiator. The only official, public negotiations to end the Vietnam War were over, never to resume. End of the Vietnam War Facts - 9: Henry Kissinger met his counterpart again in February 1970. The talks were so secret that President Nixon's Secretary of State, William Rogers, did not even know they were being held. The following fact sheet continues with facts about End of the Vietnam War. End of the Vietnam War Facts - 10: A Vietnam Moratorium Day was organized to take place on October 15, 1969. An estimated one million Americans across the US, including 50 members of Congress, participated in the 'Moratorium to End the War in Vietnam' with anti-war demonstrations, teach-ins, protest rallies and peace vigils. In a peace rally across from the White House the protestors were led by Pete Seeger singing a rendition John Lennon's song "Give Peace A Chance"
End of the Vietnam War Facts - 13: The secret Paris Peace Talks remained at stalemate throughout this period. End of the Vietnam War Facts - 14: On April 18, 1971 - 2,300 Vietnam Veterans Against the War (VVAW) camped near the Capitol, and threw away their military medals and ribbons in protest against the continuance of the war. End of the Vietnam War Facts - 15: It wasn't until January 25, 1972 that President Nixon announced that Henry Kissinger had been secretly negotiating with the communist North Vietnamese aimed at achieving "peace with honor" in the Vietnam War. End of the Vietnam War Facts - 16: The North Vietnamese launched a major offensive and in retaliation, and on 30 March 30, 1972 Nixon ordered the bombing of the Hanoi and Haiphong areas. End of the Vietnam War Facts - 18: The situation changed in October 1972 when North Vietnam proposed an ‘in place’ cease fire, allowing North Vietnamese troops to remain in South Vietnam dropping their insistence that the South Vietnamese government be disbanded..
End of the Vietnam War Facts - 19: During the period of the ceasefire it was agreed that the South and the North Vietnamese would arrange for a new government to supervise free elections which would determine the future of South Vietnam. End of the Vietnam War Facts - 20: The presidential elections were only a few weeks away and Nixon agreed to back the ceasefire "to end the war and bring peace with honor in Vietnam and S.E. Asia." End of the Vietnam War Facts - 21: The Paris Peace Accords of January 27, 1973 were intended to establish peace in Vietnam and led to a Ceasefire agreement and the withdrawal of U.S. troops in Vietnam. 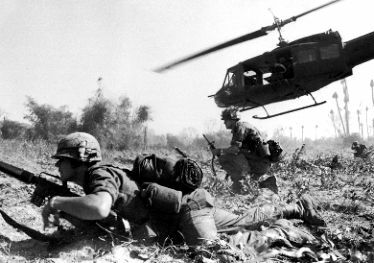 End of the Vietnam War Facts - 22: Direct U.S. military involvement ended on 15 August 1973. End of the Vietnam War Facts - 23: No sooner had the American troops withdrawn, the ceasefire agreement collapsed and the North Vietnamese Army launched a full scale invasion of the south. End of the Vietnam War Facts - 24: Saigon was captured on April 30, 1975 and renamed as Ho Chi Minh city. President Nguyen Van Theu's South Vietnamese government surrendered to the Communists, marking the end of the Vietnam War. End of the Vietnam War Facts - 25: In May 1975 the Battle on Koh Tang in Cambodia was officially the last American battle of the Vietnam War. It was the only time Americans battled against the Khmer Rouge. The article on the End of the Vietnam War provides detailed facts and a summary of one of the important events during his presidential term in office. The following Richard Nixon video will give you additional important facts and dates about the political events experienced by the 37th American President whose presidency spanned from January 20, 1969 to August 9, 1974.